Whether you are a Protestant, Buddhist, Muslim, Jew, Secularist, follower of Scientism, or any other non-Roman Catholic religion, oddly enough, there is still a very high probability you will someday find yourself in the pews of a Roman Catholic Church observing a Roman Catholic Mass. You may have been dragged along by friends to a Christmas Midnight Mass. Perhaps someone you know is getting married. Or maybe someone you want to please has really insisted you see her church. Perhaps your buddy craves after-Mass coffee and donuts. You should know that it is quite possible for you to attend a Roman Catholic Mass without embarrassing yourself, injuring yourself as you constantly jerk yourself awake, or compromising any of your own beliefs. Many non-Roman Catholics, perhaps Anglicans or Lutherans, will find the Mass to be very similar to their services. This article is meant for the non-Roman Catholics who will find all the activity to be quite inexplicable and seemingly random. It is meant to help you feel more comfortable in your surroundings. It is meant to make that one hour of your life a little less unpleasant. It can seem a little crazy with people all around you popping up and down, kneeling, sitting, and standing. Sometimes they genuflect (briefly kneeling on one knee). But, really, don’t attempt to keep up, especially if it bothers you. Sitting quietly is more than acceptable. It is preferable especially if you are at all intimidated by the activity, have trouble kneeling, feel uncomfortable joining in too much, or any other reason. Us Roman Catholics like to have visitors to our Mass. We only ask that if you are not a practicing Catholic, you refrain from taking Communion. Communion is the part where everyone gets up and starts to walk out (you think!) but then they all go up front and then return to their pews again. And then you despair of ever leaving. That part. You are more than welcome to come forward with everyone else. By folding your hands over your chest, you indicate you are requesting a blessing only. You can also just remain sitting quietly in your pew. “Quietly” is important and is also always appropriate. The church is a place for prayer. Many around you may not seem to be praying, but you can’t always tell. Quiet is the appropriate mood. So after you arrive and sit down and until the priest enters or is about to enter, you can look around at the various statues, plaques, wall-hangings, and similar add-ons all around you. Quietly. Roman Catholic churches house many stories told in many media. This is a tradition that has worked very well through the ages when many of our members could not read. For instance, look around and pick out the 14 Stations of the Cross hung all around the inside walls. These are especially used during Lent. We move from one to the next and pause at each station for contemplation and a prayer. Can you recall the story depicted at each station? Once the Priest enters and Mass starts, everyone will rise. You are welcome to remain seated. Many infirm folks will remain seated. You are not expected to stand. If you would like to stand out of politeness, that would be nice too. But, again, I expect that the remainder of the Mass will be more enjoyable to you if you do not try to keep up with the Catholic Calisthenics. 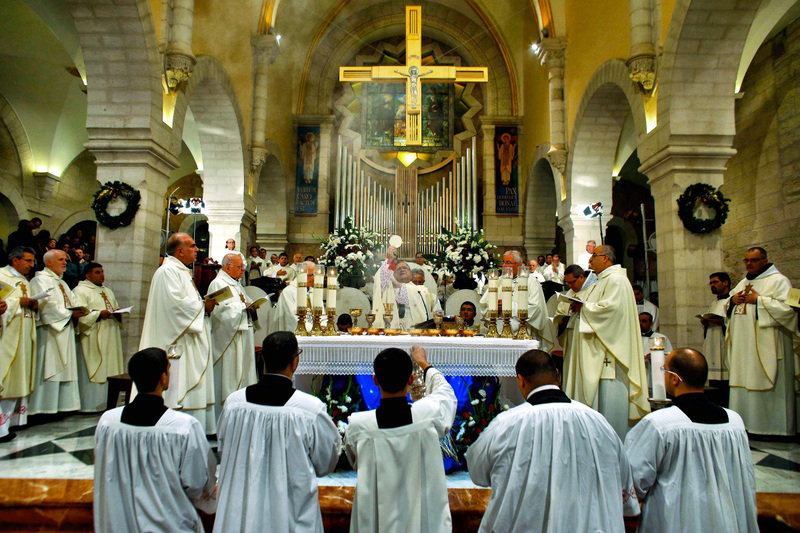 The basic layout of the Mass is this: Opening prayers which usually include a hymn, then we have scripture readings, this is followed by a sermon (homily) based on the scripture readings including a psalm which is often sung, the offering of bread and wine to God the Father (usually another hymn there), the transformation of the bread and wine into the actual Body and Blood of Jesus, the partaking of the Body and Blood of Jesus (a third hymn), and the closing prayers (a final hymn). Here are some things to look for that you may find very striking enough to keep you from playing cartoons in your head. In most Masses throughout the year, we begin with a public confession of our personal sins. This is the prayer where you will see everyone striking their chest with their right hand and begging for mercy. This is a very personal prayer that we all do, so we are not looking around to see if you are following suite. No need to strike your chest and confess to your sins if you are not moved to do so. Anyway, at this point you have probably just discovered the prayer books in the pews and are trying to find the right page. Our Old Testament reading today says: an eye for an eye. But we must understand the context of the times. This was an exhortation to not kill an entire family for the misdeeds of one member. The New Testament pushes us to go even further. Love our enemies. Do good to those who hate us. After this, we all stand and recite our creed. This is a statement of what we all believe as Roman Catholics. You will probably find something in there you do not agree with. Because, if you don’t, why aren’t you coming to Mass more often then? So, again, don’t feel compelled to join in. There follows a series of prayers for various people and causes and then we are into part of the Mass where everyone sits down with a sigh and the Priest prepares the bread and wine. This bit of housekeeping is an excellent time to sing another hymn and throw our money into the collection basket. The bread, wine, money, and all our thoughts are prayer are collected up and walked up to the altar for the Priest to offer these to God. We will gladly accept your money and put it to good use. We will not care if you put nothing in. Soon, everyone is kneeling. When the priest lifts up the bread and then the wine, this is the moment in the Mass that these gifts are transformed into the actual Body and Blood of Christ. This most certainly will be the bit you don’t believe in. But it is the holiest moment of the Mass for us. Please don’t choose this moment to look for the restroom. After that, you may notice the priest, deacon, altar servers, and lay ministers treating these items with the utmost respect. Before this, there is usually a prayer for us to recall living people we’d like to remember in our prayers. And after, a prayer for those we cherish who have passed — among other intercessions and intentions. There are several versions of these prayers. In some versions, a string of Saints are invoked for their help: For fun after Mass, see how many devout Catholics you bump into can remember who Saints Cosmas and Damian are. After a few more prayers, people line up to receive Communion. There will usually be one or more hymns at this time. After Communion, the various plates and cups are carefully washed, linen is folded, and final prayers are recited. The Mass ends with a blessing and a dismissal reminding us to go forth from here to love and serve God. As a bit of trivia, this is where the Mass got its name as “dismissal” in Latin contains that phonetic. It is polite to stand and sing the hymn while the priest and his entourage exit. You don’t have to do this and can leave before the final verse. However, it is decidedly impolite to leave out the back door prior to the priest exiting. You may see some of the congregation do this. Please don’t copy their bad example. Again, quiet is appropriate until you exit. Many life-long Catholics can’t help but buzz and murmur to their friends as they exit. After all, we’ve been good for a whole hour! But, please, try not to be too loud! There are some who remain behind for a few more prayers. If you get a chance as you leave, shake the hand of the priest or deacon and say something very brief such as “very nice”. Others want to say hi too, so don’t start a conversation until you get to the other traditional Catholic “sacrament” — coffee and donuts after Mass. A complete person has a spiritual side. And a self-aware person realizes they must have a routine to ensure that part of their persona is fed and developed. Thus, we have the habits, practices, and routines of religion. My religion is Roman Catholic. Of all the Christian religions, I find it the most representative of what Christ was, and is, trying to accomplish. All the other Christian religions must find some theory of how the Roman Catholics have strayed from the original purpose, or why have their version? I have found none of those theories to ring true to me. So I remain Catholic. A central tenet of the Roman Catholic religion is that we are all part of the Communion of Saints, on a journey back to God. A good Mormon, for instance, may in fact be closer to God than a complacent Catholic. If you find your own faith is the one true religion to you, that’s OK by me. In fact, I wouldn’t have it any other way. You need to follow your conscience.